The Battle of Liberty Place, which took place on September 14, 1874, exemplified the hostility that existed in Reconstruction-era New Orleans between the old social order on one side and so-called "carpetbaggers" and native Republicans on the other. Tempers had flared two years earlier when the 1872 gubernatorial election yielded controversial results. The Republican candidate, William Kellogg, narrowly defeated Democrat John McEnery in the disputed election. In protest, McEnery and the Democrats set up a rival administration and portrayed Kellogg as a usurper even after President Ulysses S. Grant had supported Kellogg's victory. Amidst this tension, the White League, a group closely related to the conservative Democratic Party, began stockpiling weapons and preparing for the possibility of armed insurrection. Many of the White Leaguers were former Confederate soldiers, and as their name implies, maintaining white political power in Louisiana was a primary goal. On September 13, 1874, after the Reconstruction government had blocked a delivery of weapons to the White League, the offended members of the group called for a public meeting the next morning at the Henry Clay Statue, then located where St. Charles Avenue and Royal Street intersect with Canal. The assembled men demanded the resignation of Gov. Kellogg, and when he refused, the White League decided to fight. Gathering at Prytania and Urania Streets, just over a mile from this spot, White Leaguers marched downtown with approximately 8,400 men. They erected barricades at intersecting streets extending several blocks down Poydras Street, all the way past St. Charles Avenue. Their opponents, the Republican-controlled Metropolitan Police, waited a short distance away on Canal Street. 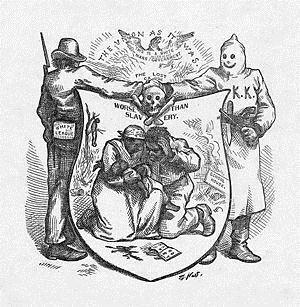 The White League: An illustration from Harper's Weekly depicts an armed White Leaguer (left) reaching out to a Klansman. Dr. Lawrence Powell, Emeritus Professor of History at Tulane University, discusses how historians interpret the battle. 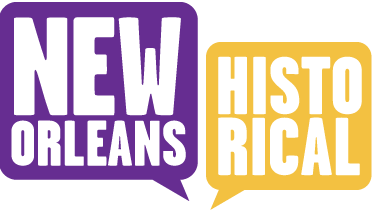 Gordon Chadwick, “Election Controversy and the Rise of the White League,” New Orleans Historical, accessed April 19, 2019, https://neworleanshistorical.org/items/show/145. Gill, James. Lords of Misrule: Mardi Gras and the Politics of Race in New Orleans. Jackson, MS: University Press of Mississippi, 1997. Loewen, James. Lies Across America: What Our Historic Sites Get Wrong. New York: Touchstone, 1999. Nystrom, Justin A. "The Battle of Liberty Place." KnowLA Encyclopedia of Louisiana. http://www.knowla.org/entry/757/. Powell, Lawrence. "A Concrete Symbol." Southern Exposure. Spring 1990. Reed, Adolph, Jr. "The Battle of Liberty Monument." The Progressive. June 1993. Warner, Coleman. “Two Sides, One Story at Liberty Monument.” The New Orleans Times-Picayune. 9 March, 1993.